Star Wars - Episodes I, II & III (Violin/Piano) (Violin). For violin solo and piano accompaniment. Play-Along; String Series. Movies and Play Along. Instrumental solo book and accompaniment CD. Solo part, standard notation, bowings, piano accompaniment and black & white photos. 66 pages. Published by Alfred Music (AP.IFM0527CD).ISBN 0757941575. With solo part, standard notation, bowings, piano accompaniment and black & white photos. Movies and Play Along. 9x12 inches.This book is part of a String series arranged for Violin, Viola, and Cello. The arrangements are completely compatible with each other and can be played together or as solos. Each book features a specially designed piano accompaniment that can be easily played by a teacher or intermediate piano student, and a carefully crafted removable part, complete with bowings, articulations, and keys well suited for the Level 2-3 player. A fully orchestrated accompaniment CD is also provided. Each song on the CD includes a DEMO track, which features a live string performance, followed by the PLAY-ALONG track by itself. 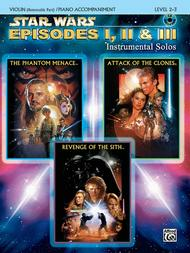 Titles are: from Episode I: Augie's Great Municipal Band * Duel of the Fates * Qui-Gon's Funeral * Star Wars (Main Title); from Episode II: Across the Stars * The Imperial March * May the Force Be with You * The Meadow Picnic; from Episode III: Battle of the Heroes * Princess Leia's Theme * The Throne Room.Recorded Acc. Available.